A great Party Bunco item to assist the Bunco Hostess. Solid colors to choose from making the creative theme of your choice possible. Make the Party Bunco an occasion to remember. 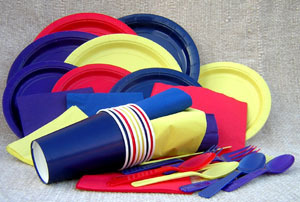 Decorate with style using our Solid Color Assorted Tableware that will complement any theme Party Bunco party. These solid color tableware items make a fabulous party all by themselves.Solid color variety ...Yellow, Purple, Red, and Royal .... Purchase your Party Bunco supplies today!